Presumably you’ve been following the saga of Toronto’s Antler Kitchen & Bar vs. vegan protesters? If not, you can catch up here. The gist is that animal-rights protesters have gathered outside (perfectly-named) chef Michael Hunter’s restaurant numerous times, leading the fed-up chef to carve and eat a deer leg in front of them last week. Following the incident, protesters returned a few days later, the Toronto Star reports. According to The Star, they’re interested in having “a dialogue” with the chef following their demonstrations. I’ll acknowledge, of course, the freedom of assembly and freedom of protest, but should these protesters not direct their message somewhere else? Why choose this small Toronto restaurant, which seems to actually care about the meat it sources and makes efforts to use the whole animal? The protest’s organizer says she’s a grassroots activist and is therefore focused on raising awareness in her local community. She told The Star that people have asked why she doesn’t protest McDonald’s, but says that her small group of activists aren’t big enough to earn a meeting with McDonald’s. That may have changed now that her protests have drawn international attention, right? I’m not vegan, but I do agree with some vegan groups’ efforts to improve agricultural animal welfare and expose the conditions in which industrial farms keep livestock. American consumers shouldn’t bury their heads in the sand when it comes to how animals that end up as fast-food burgers or mass-produced bacon are treated. But protesters’ ire toward chef Hunter and his small restaurant—which actually looks into the sourcing of its meats and employs whole-animal butchering techniques—seems misplaced. Outrage is not a zero-sum game; I can be pissed off about multiple issues simultaneously. (Just watch me on Twitter!) 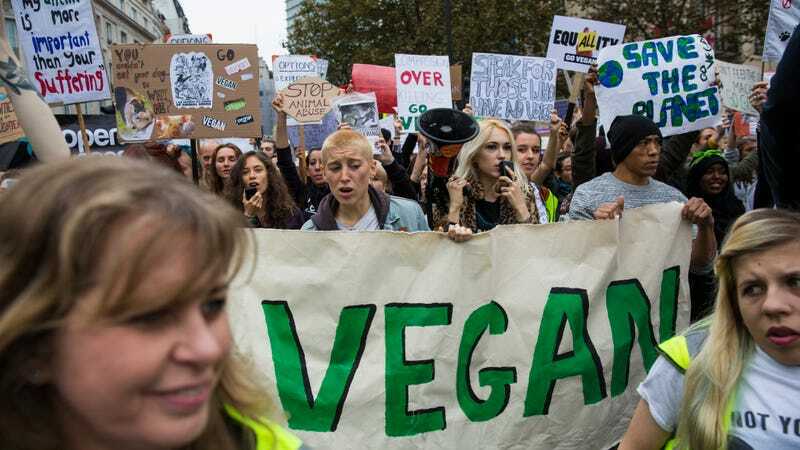 But vegans do little to advance the more righteous planks of their platform when they spend their energy attacking a small business doing what it can to serve meat in a respectful way.